Boost your Wings of War battles! The Top Fighters booster pack provides you with 2 new Maneuver Decks and exciting new planes, the Fokker D. VII and the Sopwith Snipe. This is not a complete product. One Famous Aces or Burning Drachens game set is required to play. 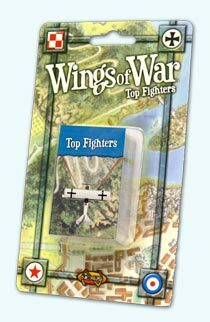 Wings of War: Top Fighters includes two brand new maneuver decks, the L amd M decks, which offer some never-before seen flying tricks! Top Fighters includes two of the best planes of the war, the Fokker D. VII and the Sopwith Snipe, as well as a host of other aircraft from Germany, Australia, Britain, and several airplanes from the Russian Civil Wars spanning 1919-1922. All the aircraft from this set use the A damage deck, and are therefore best combined with Wings of War: Famous Aces or Wings of War: Burning Drachens.